Thursday saw us hold our AGM, our ninth since officially relaunching last decade, and despite some organisation hiccoughs (those who were there know what I mean!) it was a really good night. Unfortunately, TSSA general secretary Manuel Cortes was forced to give his apologies because he was attending talks between Irish bus workers and their employers at the time. Never the less, we had some excellent speakers, starting with two comrades from Derby Unison to talk to us about the long running dispute between school support staff and the city council. Unions organiser Oliver gave us the basic run-down on the situation, in which the council had very specifically targeted school support workers for an alleged “equal pay review” that saw their already modest salaries cut by as much as 25% in some cases, forcing the union into industrial action that has been running since June last year. Teaching assistant Sarah, who works with children with special needs, spoke very m ovingly about how her colleagues desperately wanted to just go back to jobs that they care about deeply, but are losing homes and livelihoods and feel they have no choice. Disappointingly, Derby city council is a Labour administration (with a majority of one!) that has proved intransigent to appeals from the national leaderships of both Unison and the Labour Party. Barnet TUC resolved to donate one hundred pounds, and do a collection on the night, but more importantly to get this massive dispute to be more widely known to help these essential workers get justice. We are all being asked to write to Derby councillors and urge them to end this attack on school support workers. Get more information on the Derby City Unison Facebook page. Next we heard from Phoebe Moore, of the UCU, speaking about her work with the Freedom of Movement campaign. Freedom of Movement was set up by university workers in response to threat that restrictions on immigration have toward higher education in this country, and what they perceived to be a drift within the labour movement to supporting this by endorsing restrictive “points based” systems that countries like Australia use. They have been primarily working on getting educational institutions to commit to passing motions affirming support for free movement, but are now urging other parts of the movement to come on board. Our own Unison members followed this up with their experience of trying to organise a symbolic “One Day without Us” event on February 20th. They found out that there was actually significant fear among EU national workers about doing simple things like being photographed holding “I am Immigrant” placards, showing how necessary this work really is. Bahir from the NUT also urged the meeting to remember that freedom of movement is something that we want for all people, not just those of certain nationalities, we are internationalists not just Europeans. Our final speaker Miriam Scharf from the Middle-East and North Africa Solidarity Network. Although MENA, which was formed in 2011 in response to the wave of revolutions in the region, actually gets involved in workers’ struggles in many countries, Miriam spoke to us primarily about the organisation’s work with activists in around Egypt. 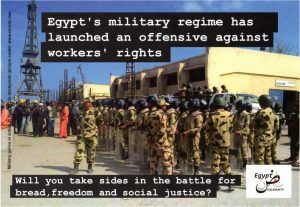 Despite heavy repression since the counter-revolution of 2013, workers and activists in Egypt have continued to take action – there are actually more strikes per year in Egypt than in Britain, despite striking being completely illegal. MENA was part of numerous important campaigns, such as the campaign to get the labour lawyer Haitham Moham edain released from prison and support for Alexandria dockworkers, ultimately successful, action against their military employers (pictured). Miriam urged urgent support for an Amnesty International letter writing campaign that is happening now, justice for Italian Cambridge University student Gulio Regeni, who was captured and murdered while in Egypt researching the conditions of Egyptian workers in January last year. BTUC voted to affiliate to MENA. The posts of treasurer and deputy treasurer will announced shortly. I think I can speak for the entire committee and say that we are all looking forward to a fresh year’s campaign, starting with the march against racism next week. The AGM is Thursday of next week. As usual, we’ll have a slightly different order of business. With plenty of time for discussion afterwards! See you all there at the Safari Bar, 975 Finchley High Road N12 8QR, at 7pm this Thursday, March the 9th. 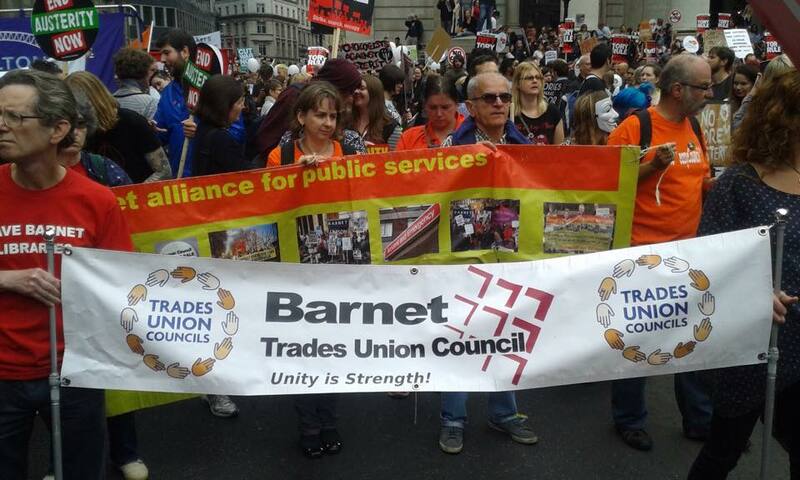 9th of March: Come to Barnet TUC’s Annual General Meeting! It’s that time again. Barnet TUC will be having its 2017 annual general meeting once again in Finchley’s own Safari Bar, 975 Finchley High Road N12 8QR, at 7pm this Thursday, March the 9th. 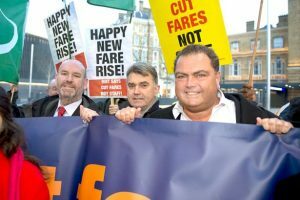 This year, we are welcoming a keynote speech from Transport Salaried Staffs’ Association general secretary, Manuel Cortes, who will be speaking to us the range of challenges that transport workers are taking on with our wider labour movement in Britain and internationally. The Free Movement of Labour Campaign – a trade union backed movement to fight for the rights of workers to support and maintain the existing rights to free movement of labour of EU residents in the UK and EU member states. The Middle East and North Africa Solidarity Network – a network of activists from different unions in the UK engaged in building solidarity links with workers in the region since the revolutions of 2011. 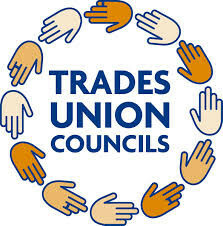 The AGM is the event where we ratify our committee and structure for the coming year, so we can carry on the vital work of giving trade unions a voice in the community, and we want our friends from that community to come and participate. So come to the Safari Bar, take part in debate and stay for drinks (as well as some snacks that will be layed on!) with Barnet TUC. A big thank you goes out to everyone who came to our annual general meeting. 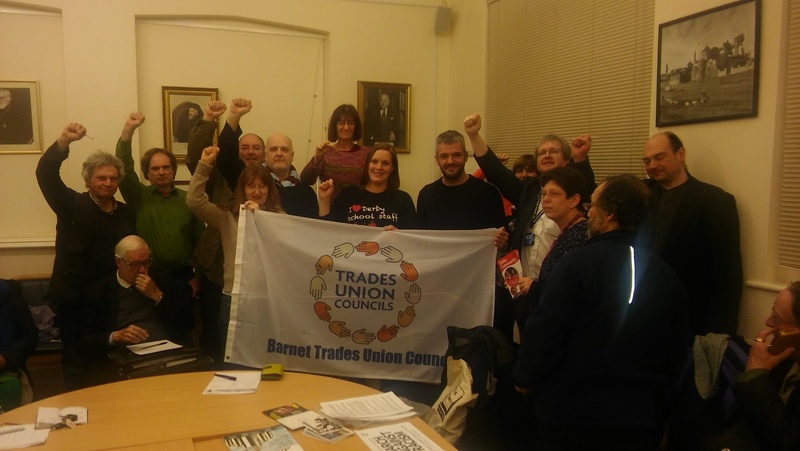 Barnet TUC elected its committee for the new year and had a series of excellent speakers who sparked off an excellent debate about how we as movement can take the struggle for social justice forwards for another year. Our first speaker was the academic and activist Linda Kaucher, who came talk about the threat posed to equality and democracy by the transatlantic treaties know as TTIP and, more urgently in her view, CETA. Although these are packaged for the public as “trade” agreements, Linda warns that they have very little if anything to do with trade, and everything to do with deregulation. Tariffs between EU and North American countries, she points out, are and have been very low for a long time, but standards of regulation to protect health, safety and the environment are much higher. Big business is lobbying hard for these treaties because it does not want such protections to get in the way of profits. An interesting debate ensued about the implications of this, and what it might mean in terms of the forthcoming EU referendum, but there was consensus that more needs to be done to oppose TTIP. 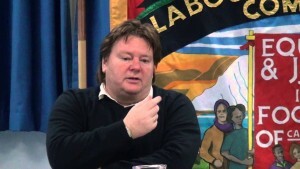 The next speaker was local councillor and new leader of the Barnet Council Labour group, Barry Rawlings. The Labour (and Lib Dem) counsellors have challenged the hard-rightwing Tory council this year by submitting complete alternative budgets, approved as valid by the council finance officers. Barry emphasised that the Tories have been pushing for massive cuts and privatisation by claiming that they have no choice in the matter because of reduced revenue (itself a Tory policy, of course, though they ignore this! ), whereas the budget he’d moved showed that there was in fact a range of political choices that can be made in allocating resources. Among other things, they had had a proposal to replace all 800 social homes that are currently being lost through council regeneration projects, as well as significant defence of care services through use of a ring-fenced council take increase that would cost Barnet residents no more than 10p a week. The Labour group has invited the wider movement to have some constructive input into what choices a progressive council, that we could achieve, would do. There was very enthusiastic discussion about this, as no issue is more urgent in Barnet right now than putting a stop to the extreme austerity agenda. We all agreed though, that further resistance is also needed between now and the potential election of a new council, if there is to be any public services left to utilise, and libraries continue to be one of the key front-lines. The evening was rounded off by Ian Hodson, national president of the Bakers, Food and Allied Workers’ Union. He’d come to our meeting directly from spending the afternoon on a picket line of striking Junior Doctors, who he hailed as fighting a battle for us all and warned us not to let them be another National Union of Mineworkers. He proceeded to give a wide-ranging speech about the goals of his union and its struggle for equal rights and fair pay for young workers, who are massively exploited at the moment. He also emphasised the importance of the struggle against rise of racism, represented by the outrageous rhetoric that David Cameron has used against refugees. BTUC will be organising a Barnet meet-up for the March 19th demonstration against racism in London in that spirit.